For my last service project as Miss Inver Grove Heights, I made it a unforgettably colorful one. 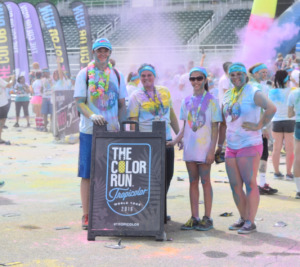 Sunday, July 10th, I got a group together to do the color run at the state fair grounds. This run is one of my favorites because it donates the money to local charities in the host city. This year the color run is working with 2 big organizations, Special Olympics Minnesota and the YMCA of the Greater Twin Cities. Joining me was our Little miss Inver Grove Heights Princess, Taylor, my sister, Brittany, and A past Jr Winter Carnival King Frost, Nick. We also had 3 more amazing ladies on our team, Alicia(past IGH Princess), her cousin, and a close family friend, Rachel. Last year I fell in love with this run because I saw how many people were there and if you do the math, the charities will get so much help. It is an absolutely amazing way to help the community around us and have fun while doing it. I am so thankful for my team, Colorful Crowns, and will continue in the years to come.